A celebration of the musicians who backed the two icons of the blues, Muddy Waters and Howlin’ Wolf, will occur this Friday, Jan. 11 at 7 p.m. at a special screening of the new film, “Sidemen: Long Road to Glory” as part of the community outreach program, Harvey Presents in The Walker Center for the Arts on the campus of The Harvey School. “Sidemen” producer Tony Grazia and the film’s director, Scott D. Rosenbaum, will be on hand to introduce their film and lead a talkback about the making of the movie following the screening in The Walker Center’s Lasdon Theater. Joining the filmmakers for the Q/A will be Grammy Award-winner Paul Nelson, guitarist for Johnny Winter’s blues rock band. Director of Programming Vinny Alexander is excited to have Harvey host the “Sidemen” screening. “We’re calling this year’s programming, Harvey Presents “Harvey’s Own” as our events feature artists who are connected to our own school community,” Alexander said. “The film’s producer, Tony Grazia, is the husband of our communications director, so we’re especially delighted to have him share his experiences of making this extraordinary documentary,” explained Alexander. “There are no bigger names in the world of the blues than Howlin’ Wolf and Muddy Waters,” Alexander said. 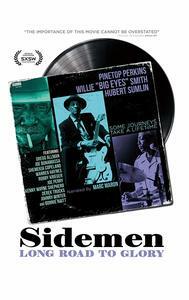 “And thanks to this film, we learn their fabulous sidemen were an integral part of what drew so many to be devotees of the music of the two great blues artists,” Alexander said.